An attempt to load an unsafe library was detected and blocked. At work (Win7 64x). I'm not sure if this warning is generated by your program or by the system (the MessageRequester only says "Security Warning" in the title, nothing that would indicate that it belongs to your tool) and no log file is generated in the directory you specified earlier. That's a Forkle message (I will make that clearer in the next build). Does this warning get triggered on a specific URL? Is it an intranet page by any chance? On startup. It takes 1-2 seconds, then this message appears. Clicking "OK" terminates the program. I don't see any website loaded or URL in the address bar. This one will be tough to troubleshoot as I don't have access to a Win 7 system at this time. On Windows 10? Weird, I thought that setting was off by default. Well, I cannot recall ever having heard such a "Start Navigation" sound before. 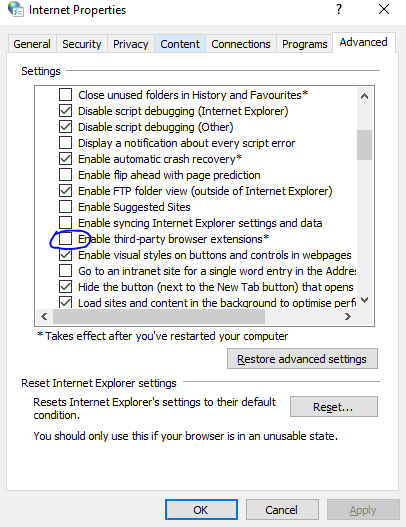 To be sure, I just tested it: Neither Chrome, nor Firefox, nor IE 11, nor Edge produces a sound when opening a new page. Maybe you can switch that sound off in Forkle? That would be especially useful for portable usage on a USB thumb drive, since I certainly are not going to change any system settings on other people's computers. However, I'll probably mostly use Forkle on one of my own PCs, so this point isn't crucial for me. This is an old system setting - try disabling it in your system sound settings. That worked fine for me, and now I'm enjoying the "sound of silence". Thank you for your detailed instructons! Forkle accepts a URL as parameter on the command line. I find that very useful. Maybe you can switch that sound off in Forkle? That would be especially useful for portable usage on a USB thumb drive, since I certainly are not going to change any system settings on other people's computers. I will look into it. By the way, did you have that annoying sound issue on both Windows 10 computers? I'm trying to find out what the default setting is. By the way, did you have that annoying sound issue on both Windows 10 computers? I'm trying to find out what the default setting is. Yes, on both computers with Windows 10 Pro (October 2018 Update). p.p.s To display spiderbasic applications, your browser is ideal. The problem is to convince potential users of security, you need to take care of the official signature and other trust attributes. @useful: Thanks for your feedback. I will look into these things in future releases.